An obituary typically contains a report of a recent death. It usually includes certain information about the deceased person and the upcoming memorial program. 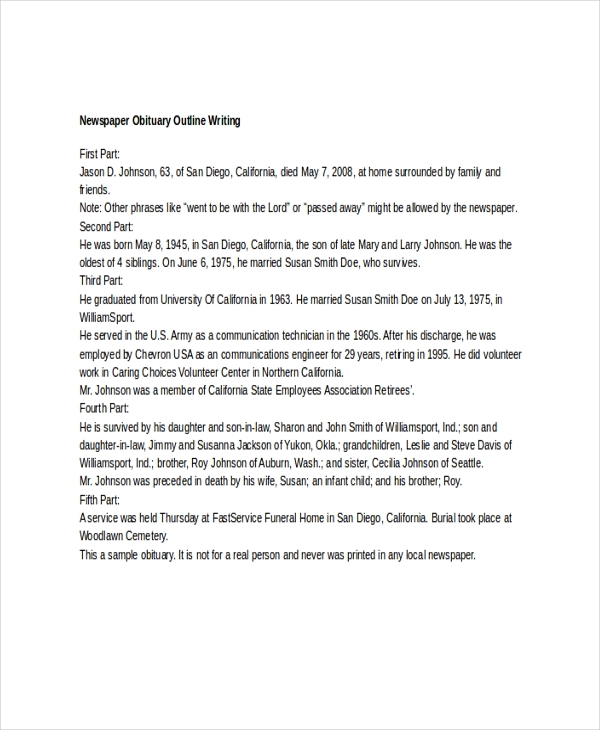 Typically, obituaries are included in a newspaper, and are basically written with the intention of informing the general public of the death of a significant person, or any resident of a certain area, along with a brief biography of such person. The media often prepares a prewritten obituary for significant and influential persons of a specific area even before their death. Free writing of obituary, in the simplest sense, is the act of writing an obituary. It is typically known as a commemoration of someone’s death. An obituary can be written by a family member, a close relative, or a friend, often assisted by the funeral home, which they usually send to the media (usually newspapers or publications) for printing. Of course, such process can be applicable to anyone. However, for most public figures, the media staff conducts a research of their lives and may write the obituary beforehand, which will be printed upon death. An obituary (or writing one) can be painful to some, but because it contains a detailed but brief presentation of a deceased individual’s life, it can also be a way of remembering how such individual has lived over the short course of his/her life. It is also one way for family members and friends to inform the public how the deceased individual shall be missed and remembered, and how his/her death pains them. With this, the general public will be able to sympathize with the family’s loss, at the very least. Writing an obituary, to most people, is a meaningful process. 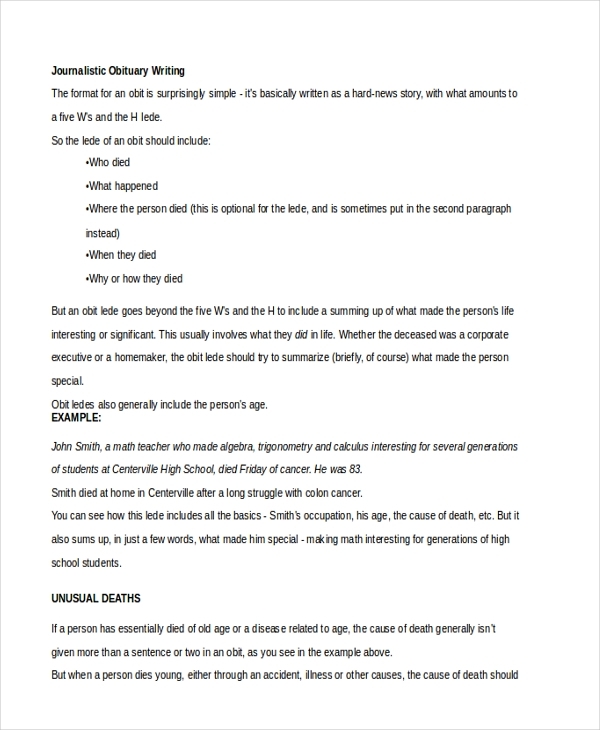 It is the writer’s responsibility to write an obituary that will be able to reach the family members and friends of the deceased person, and of course the readers. 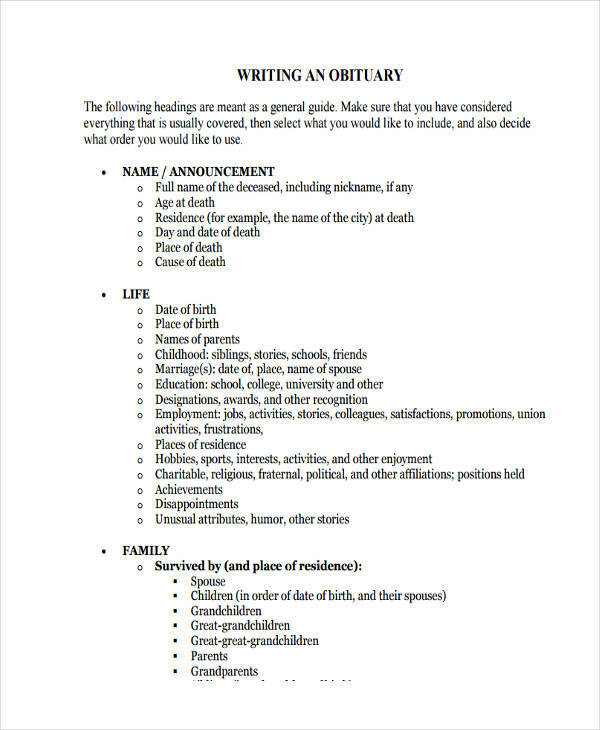 Here are some tips on how to write an obituary. Read other obituaries. 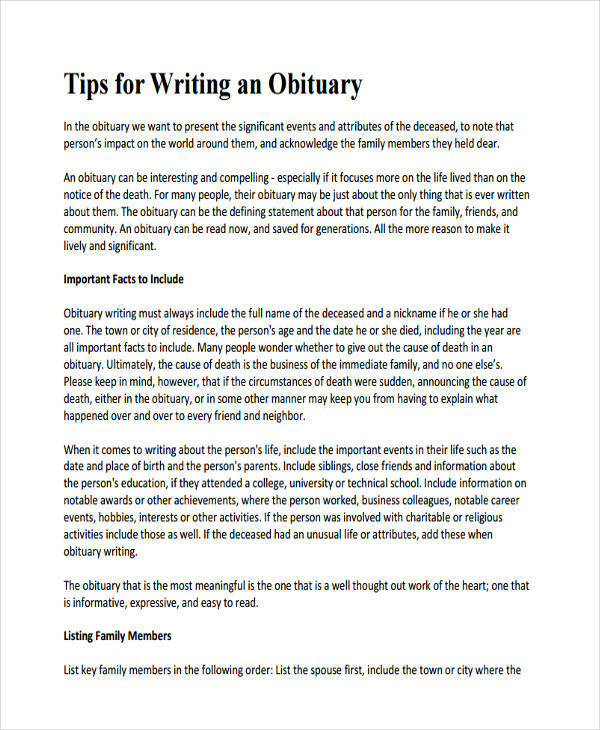 Doing such will provide you the idea on how to write an obituary for a friend or a relative. This will also provide you an idea on what to include in your composition. Write the announcement of death. This is to state the fact that the deceased has passed away, including the date and time of death. List down the information about the deceased. This includes a brief description and biography of the deceased, and the significant experiences in his/her life. Provide information on the funeral and memorial services. This includes information regarding the funeral notice and memorial services, along with the burial, the address, date and time, and other necessary information. Include a list of surviving relatives. This is to provide a list of the people who means a lot to the deceased. Include additional information. Such information may vary depending on the writer’s discretion. Proofread. 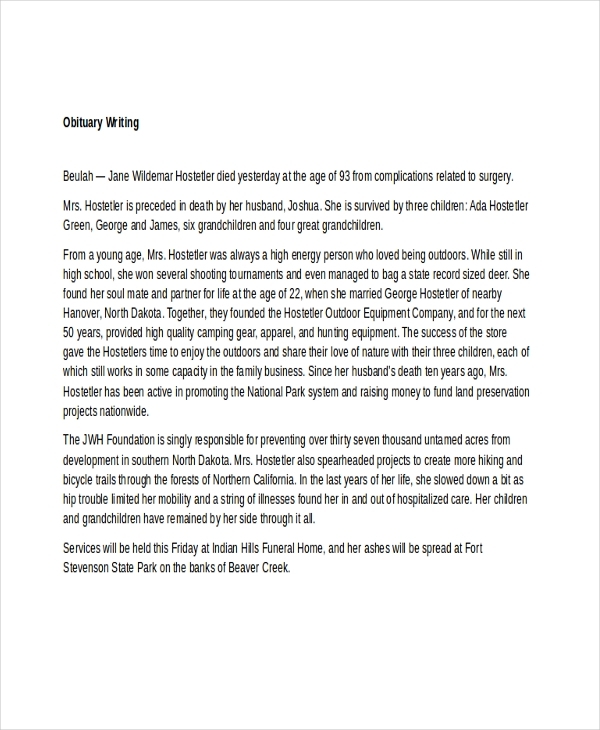 Before printing the obituary, recheck the information you provided for errors and accuracy. You can also ask someone else to proofread your work for you.